If you've been following along with my weekly inspirations, it should come as no surprise that antique illuminated maps served as the primary inspiration for one of my scarf designs. As a genre, illuminated texts are undeniably intriguing due to their level of intricacy, ornament, and oftentimes, strangeness. 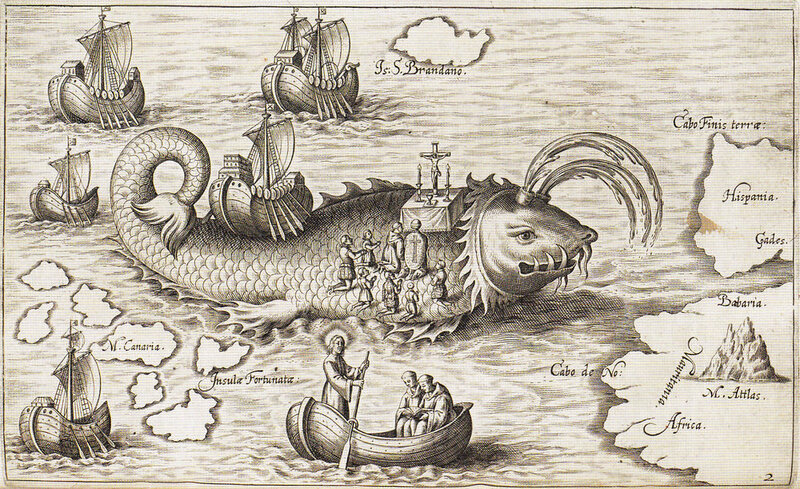 Of course, maritime mapping is just one form in which this practice was applied. From the many media that were honored with illumination, I chose this application to focus on partly to steer clear of the religious material on which many illuminated texts are based, but also because of the striking recurring motif of the Compass Rose, the namesake of my scarf design. The Fra Mauro map, the 1459 eponymous work of Venetian monk Fra Mauro from 1459, is seen as the most important remaining example of map making from the medieval era. The Fra Mauro Map, 1459. Piri Reis, an Ottoman naval commander and cartographer, is a personal favorite find of mine due to his unique, simplistic, and colorful style. Piri Reis, Map of Alexandria, Egypt. Piri Reis, Map of Unidentified Islands Off the Southern Anatolian Coast. His best known work, however, is his 1513 Map of The World, famous not only for being one of the oldest existing maps to include America, but also for inexplicably depicting Antarctica, thought not to have been yet discovered at the time. History buffs love a conspiracy theory! I'm more interested in it for its beautiful patina, strange composition and scale decisions, and detailed illustrations that reward the viewer for taking a closer look. A later printing of the Map of The World. Another major work of Reis is his collection of 240 maps and charts executed for and dedicated to Sultan Süleyman I (“The Magnificent”) in 1525 titled Kitab-i Bahriye, or Book of the Sea. Around this time another famous map, commonly referred to as the Carta Marina, was created by Olaus Magnus, and is so famed because it is the first map of the Nordic countries to contain detailed labels. Much like The Map of The World, however, I value it for its astonishing detail, craftsmanship (it was originally a woodcut! ), and delightfully quirky personality—although I'm sure it was not seen as such at the time. The Carta Marina map, Olaus Magnus, 1539. 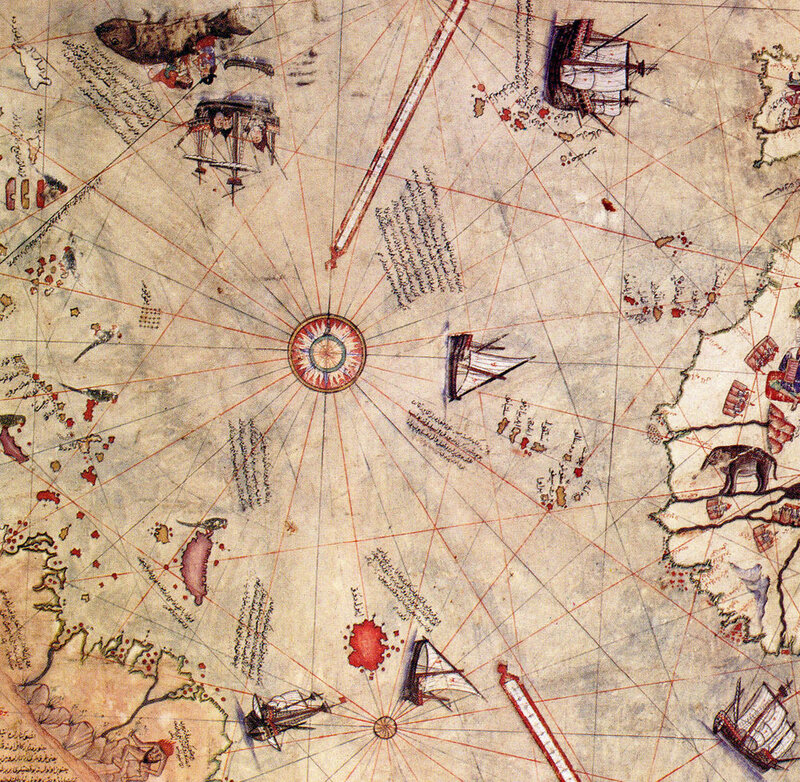 Detail of the Carta Marina map. Map of Tartaria, Abraham Ortelius, 1570. An Ichthyocentaur plays a viol on a map from a 1573 edition of Ortelius's Atlas Theatrum Orbis Terrarum. By the 17th and 18th centuries, the maps are starting to look more familiar, and mainly followed the style shown below. There is still lots of interest to be found in the lush illuminations, however, such as Cerberus, the three-headed dog guarding the underworld, in the upper left-hand corner. World Map, Gerard van Schagen, 1689. And let's not forget the Compass Rose! 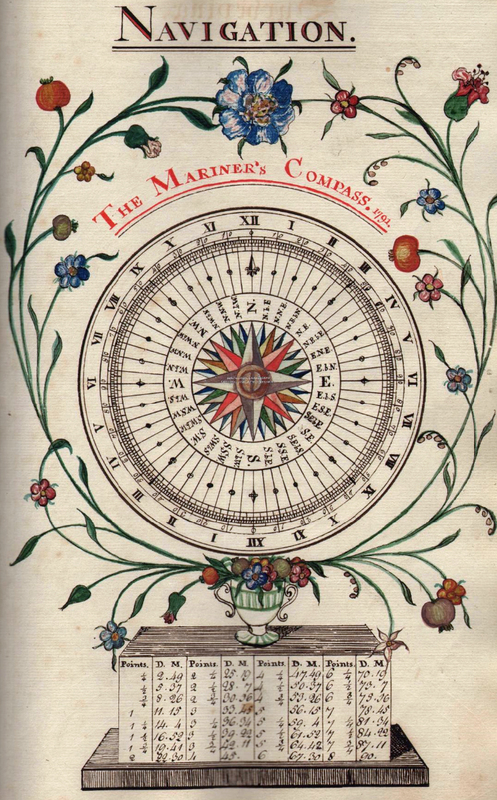 Jumping ahead 100 years, The Mariner's Compass, 1791. Image from Maine Memory. There is something so attractive to me about this nearly universal symbol. Like all enduring symbols, it is visually striking and has the ability to be endlessly adapted. Especially intriguing is that the idea of four directional points is proven by linguistic anthropological studies to have been used by the majority of societies. The unifying, grounding, nature of the Compass Rose is therefore not only imagined, but perhaps indicative of an innately human way of making sense of the physical world around us.